Size 130mm x 110mm. The next layer is the sticker itself. As you can see in the diagram the sticker consists only of the logo itself, there is no background or clear area around it. The bottom layer is the backing paper, the adhesive underside of the sticker rests on this. 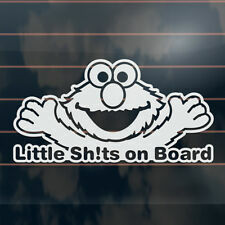 Elmo Little Sh!ts on Board Car Sticker 200mm. Design Elmo Little Sh!ts. Size 200mm x 100mm. The next layer is the sticker itself. As you can see in the diagram the sticker consists only of the logo itself, there is no background or clear area around it. Mickey Minnie Mouse. Default style: Option 1 (Minnie). 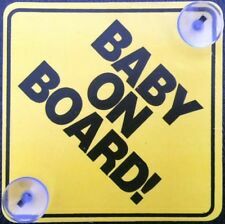 Baby on Board Car Sticker Decal Sign. Computer cut vinyl decal without background. If you want another colour excl. you can choose one style between option 1 and 2. 2 of Yellow Baby on Board Plate. Clean surface and remove any dirt, oils before attaching decal. Place decal on a hard smooth surface (front side of decal facing up). Tape and secure the top of decal to surface. DO NOT remove the application tape. DADDY'S PRINCESS ON BOARD Sticker 180mm. Size 180mm x 95mm. Design Daddy's Princess. The next layer is the sticker itself. As you can see in the diagram the sticker consists only of the logo itself, there is no background or clear area around it. Baby on Board Window Decal. Remove backing paper from sticker, leaving sticker on application tape. Apply one edge of sticker to surface, slowly apply the rest of the sticker onto surface, rub over firmly. LITTLE LADY ON BOARD Sticker 210mm. Size 210mm x 70mm. Design Little Lady On Board. The next layer is the sticker itself. As you can see in the diagram the sticker consists only of the logo itself, there is no background or clear area around it. Printed on Marine Grade Vinyl using original Roland Eco-Sol Max Inks. Size: approx 120mm 90mm. The next layer is the sticker itself. As you can see in the diagram the sticker consists only of the logo itself, there is no background or clear area around it. The bottom layer is the backing paper, the adhesive underside of the sticker rests on this. 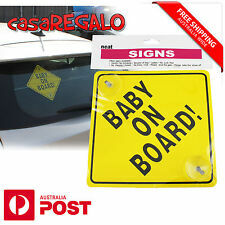 2 pcs Yellow "Baby on Board" Safe Sign. For the best result, wipe clean the surface before sticking them on. Colour: Silver White. Material: Vinyl. Computer cut vinyl decal without background. If you want another colour excl. Default style: Option 1. you can choose one style among option 1 ~ 3. What you will receive: Small: 12cm long. No problem with wipers. 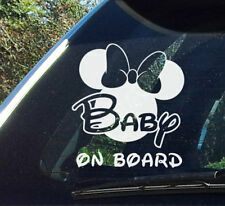 1 x Baby In Car Decal Sticker. Tear off the gule paper, and paste the sticker on your car. Material: Vinyl. Clean your car surface where will be paste and dry up. DIY your own personalized car. You will get all the detail on Checkout. Car Decal Sticker ×1PC. Good to notice the people your cute baby is on the car. Adjust the erea that needs to be pasted, remove the red film, then paste it. (Make sure the location is dry and free of dust so that it can be pasted perfectly.). Made of high quality aluminum alloy, durable and waterproof. Good to notice the people your cute baby is on the car. Adjust the area that needs to be pasted, remove the film, then paste it. Press it with appropriate force after pasting. Product: Baby On Board Giraffe. Die-cut made in NSW with long-life quality vinyl. Simple and clean application. Car Window Novelty Vinyl Decal Sticker Add a little fun and style to your car with this great car Vinyl. 1x Decal Sticker. Stick your vinyl to virtually any flat surface for a high-quality professional look. 1 x Baby On Board - Boss Baby vinyl sticker/decal. Digitally printed using Eco-Solvent CMYK ink on premium quality vinyl and gloss laminated to increase the durability and life of the sticker. Waterproof UV Resistant. Tear off the gule paper, and paste the sticker on your car. Material: PET. Clean your car surface where will be paste and dry up. DIY your own personalized car. We will reply you ASAP. SIZE: MUMMY'S PRINCE. The decals are made to last up to 8 years outdoors! Our vinyl cut decals have NO background and are UV resistant, Waterproof and easy to apply and remove and will stick on almost any smooth clean surface. ONLY the WHITE sections in the image are part of the sticker. The BLACK sections are the background and are not part of the sticker. SIZE: BABY ON BOARD. The decals are made to last up to 8 years outdoors! 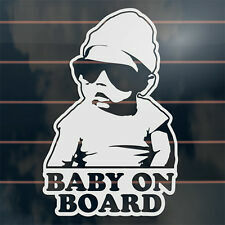 1 x Baby In Car Decal Sticker. Tear off the gule paper, and paste the sticker on your car. Material: Outdoor Vinyl. Clean your car surface where will be paste and dry up. Also note that monitor settings may vary from computer to computer and may distort actual colors. SIZE: MUMMY'S PRINCESS & DADDY'S PRINCESS. The decals are made to last up to 8 years outdoors! Our vinyl cut decals have NO background and are UV resistant, Waterproof and easy to apply and remove and will stick on almost any smooth clean surface. 3M Cute Baby in Car Sticker Decal. Material: 3M reflective. Baby in Car Stickers. Baby in Car sticker are Relective and could notify other driver even it is at night. 1 x Baby in Car Sticker. Lowest Price in Australia. With stay - put suction disks. 1 x Baby On Board. 1 pcs Yellow Safe Sign. Hard plastic. We will send you a reminder shortly after this if we have not heard from you. 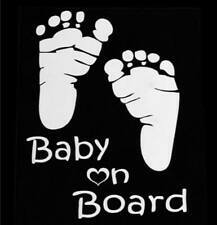 Baby on board vinyl sticker 200mm long available in various colors. Please leave your color choice in checkout thank you. 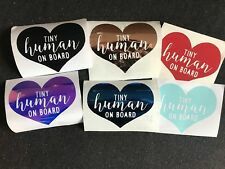 Tiny Human on Board Window Decal. Apply one edge of sticker to surface, slowly apply the rest of the sticker onto surface, rub over firmly. Let it stick on surface about 10-15 minutes to make adhesive work. These decals are made out of a high quality indoor/outdoor vinyl that will last many many years in any weather. Very strong and long lasting. The decal can be removed whenever you would like. The decal is a cut-out. WINNIE THE POOH. BABY ON BOARD. Product: Baby On Board Batman DC. Die-cut made in NSW with long-life quality vinyl. Simple and clean application. #DADlife Sticker 200mm. Size 200mm x 75mm. It is simply a matter of peeling off the backing paper and then sticking the application tape and the sticker where you want to apply it. When you remove the application tape only the sticker will remain. ONLY the WHITE & PINK sections in the image are part of the sticker. The BLACK sections are the background and are not part of the sticker. SIZE: DADDY'S PRINCESS &. MUMMY'S PRINCESS. The decals are made to last up to 8 years outdoors! We make our stickers using high end, outdoor graded vinyls and inks to ensure the final product is of the highest quality. Like to discuss customised products or can't find what you're looking for on our website?. SIZE: BABY ON BOARD - FUNNY. The decals are made to last up to 8 years outdoors! Our vinyl cut decals have NO background and are UV resistant, Waterproof and easy to apply and remove and will stick on almost any smooth clean surface. Baby On Board Footprint Car Vinyl Window Sticker Child Safety Sign Decal. Car Window Novelty Vinyl Decal Sticker Add a little fun and style to your car with this great car Vinyl. 1x Decal Sticker. Stickers can be mirrored for fitting inside your window when requested. 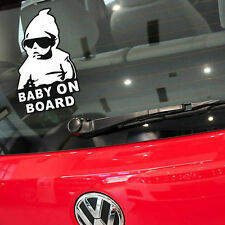 Baby on Board Sticker 170mm. Size 110mm x 170mm. Design Baby on Board (sunglasses). The next layer is the sticker itself. As you can see in the diagram the sticker consists only of the logo itself, there is no background or clear area around it.